Hacking Elvis: The Alive Elvis Robot is a Hacker's Delight! 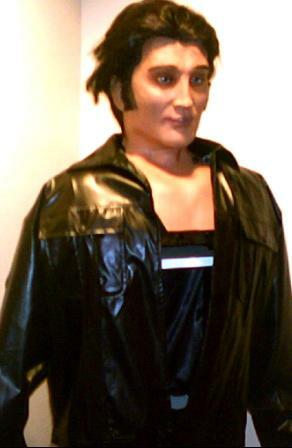 Wowwee Robotics' Alive Elvis is a robotic toy just BEGGING to be hacked. 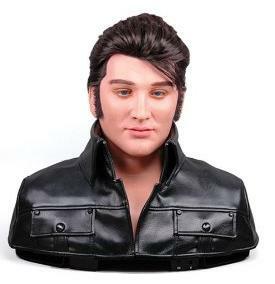 In this series of articles I will show how I took a normal Alive Elvis and converted it to a computer controlled animatronic head that not only can sing ANY Elvis songs (you provide the music) but I will show how I am now able to control ALL Elvis's motors and position them anywhere without even opening up his head. 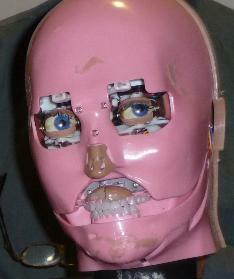 Hacking an animatronic figure can be quite rewarding! Are you ready to hack? This was not an easy task for me and indeed I did have a lot of help from two other people. These people who were instrumental in reverse engineering Elvis were Tim Lewis of Orange County, California as well as Steve Cook from Burbank, California. It took Tim took months of effort coding and engineering. And figuring out the analog to digital converter board was the hardest part of the job. Still the final ability to control this very animatronic human head is the coolest thing we have ever done in many years of building robots. So, do you want to hack Wowwee's Alive Elvis robot? Do you? Is this right for you? Do you want to know how to send his motors anywhere you want? Do you want to blink his eyes and even just WINK one eye like the original could not do? Do you want your very own computer controlled cyborg? THEN READ ON, Read on. In this article and several of sub-articles, we will tell you EVERYTHING you know to disassemble Elvis, re-assemble Elvis, and most importantly everything you need to know to RUN ALL HIS MOTORS.